Blackburn have completed the loan signing of striker Anthony Modeste from Bordeaux until the end of the season. The 23-year-old passed a medical and agreed personal terms with the Lancashire side on Thursday. 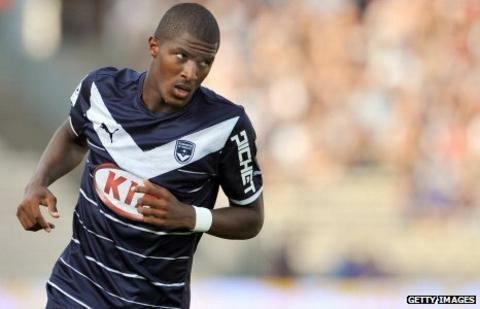 Modeste joined Bordeaux from Nice in 2010, but had fallen out of favour with the club and lost his first-team place. The deal, which does not include an option to buy, is Steve Kean's first significant signing in the January transfer window. "He's got a lot to prove as he went to Bordeaux for a big fee but I think he could be a real addition to our squad," said the Blackburn boss. "He likes to play on the shoulder of the defender, to run in behind, he can stretch the game and technically he's good," Kean added. The forward's addition will provide a welcome option up front as the club's top scorer Yakubu is banned for three games after he was shown a straight red card in the 3-1 victory over Fulham last weekend. Modeste has scored 11 goals in 38 games for the Ligue 1 side with his last goal coming in a 2-0 win over Caen in November. Meanwhile Kean has held talks with unsettled captain Christopher Samba, and has told the Congolese player he will not be sold. The defender but Kean said the club were determined to ensure he honoured his contract. "I spoke with him [on Wednesday] and he knows he is not for sale," Kean said. "We have refused his transfer request and won't welcome any more bids. Chris knows the stance of the club. "It is never nice when somebody hands in a transfer request but hopefully we can now move on."